Drs Mark Tarrant and David Llewellyn have exceeded their £1,550 fundraising target for the Society, raising over £2,000 so far to boost the Society’s ground-breaking dementia research. Donations can still be made on their JustGiving page. Throughout the journey the dedicated duo battled sweltering heat, with temperatures soaring to almost 40 degrees. The pair fought through several punctures, numerous falls, and plenty of aching limbs. 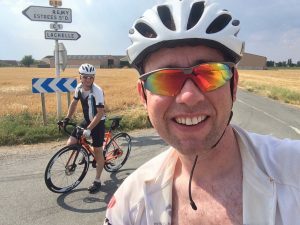 However, it was second time lucky for Dr Llewellyn, who had planned to join a team of six dementia researchers on the charity cycle last summer, but had to withdraw after breaking his wrist when he fell off his bike during training. 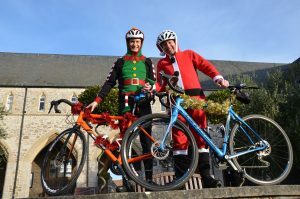 The heroic twosome started early from London, with their route passing through the picturesque Kent countryside, and crossing the Channel at Dover. 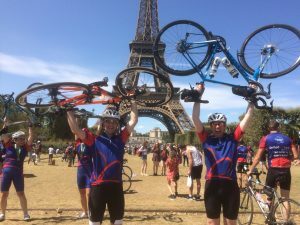 Their journey continued through Northern France along to the Paris finish line at the iconic Eiffel Tower. Their average cycle time was more than six hours, covering approximately 130 km per day. 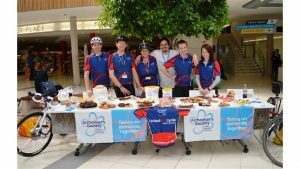 The Alzheimer’s Society annual London to Paris ride saw 150 cyclists all riding for the same cause. Their route took them across from the Arc de Triomphe, down the Champs- Élysées and round the Eiffel tower. Last year’s Exeter team raised more than £12,000 for Alzheimer’s Society. The Alzheimer’s Society provides information and support, funds research, campaigns to improve care, and creates lasting change for people affected by dementia. With someone in the UK developing dementia every three minutes, the need to unite in the fight against dementia has never been more pressing. Dementia is one of the University of Exeter’s key research focus areas, with outstanding research quality and a growing body of internationally-renowned academics. The pair have received support from Alzheimer’s Society in recent years for their ground-breaking dementia research. You can support the pair’s fundraising via Dr Tarrant’s JustGiving page.